There are many things that can affect the performance of an air compressor – poor maintenance of a compressed air system, an undetected leak or even something as simple as unwittingly purchasing a used air compressor from an unreliable source. 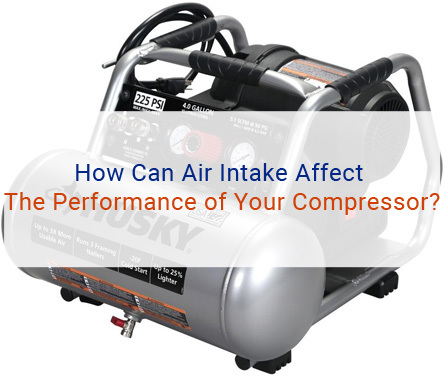 One thing that is commonly overlooked when assessing the performance of an air compressor, however, is the impact of poor quality intake air. This needs to be cool and dry as possible. It doesn’t sound like the most obvious reason for a compressor not to be working at it’s best; after all, a compressor should be able to take in air of any quality and compress it regardless, right? Well, actually, that isn’t the case. Depending on where you position your air compressor, be it fixed or portable, you may be hampering the performance of your equipment as well as letting yourself in for some unexpected maintenance costs. One of the biggest problems with intake air is particles and dust. Particulates can be problematic as they can slow down the movement of air in your system, reducing the efficiency and output of your equipment. Similarly, any dust, moisture and other such contaminants taken in with air can build up on the parts of your compressor, affecting its ability to work properly – which can increase your energy expenditure and future maintenance costs. The obvious solution to this is to ensure that your compressor is placed away from any particularly bad sources of dust, moisture or other particles that may affect air quality. Installing model-appropriate air filtration systems will also help alleviate the negative effects of poor quality air. It isn’t just particles in the air that can affect the performance of your compressor, however; the temperature of the air taken in by your compressor can also affect how well it carries out it’s primary function. Warm air is harder to compress than cool air, which means placing your compressor in a warm environment is also placing your compressor in an environment where it has to work twice as hard and thus expend more energy. The solution to this is simple: place your compressor in a cool location. If you have to place your equipment near a source of heat, try and install cool air ducting equipment that will pull in cool, dry and most importantly CLEAN air and keep compressor as cool as possible. In short, monitoring your air compressor’s air intake is incredibly important with regards to keeping it running at it’s best. Make sure that your compressor is located in a cool, clean environment and is installed with the proper filtration. You’ll save money on your energy bills, as well as avoiding any unscheduled air compressor maintenance!